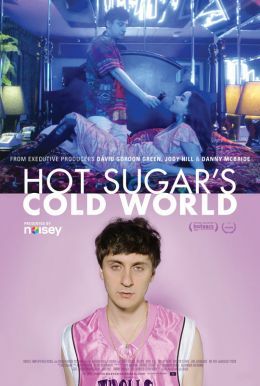 From internationally acclaimed filmmaker Adam Bhala Lough, and Executive Producers David Gordon Green, Danny McBride and Jody Hill, Hot Sugar’s Cold World is a fly-on-the-wall look into the life of a modern-day Mozart, Nick Koenig (Hot Sugar) as he creates one-of-a-kind music made entirely out of sounds from the world around him. Nick lives every young musician’s dream, but when his internet- famous girlfriend, (rapper Kitty) goes on tour and they split, he flies to Paris where he grew up, to move on with his life, while hunting for increasingly unique and exotic sounds to sample and turn into beats. Through his journey, Hot Sugar goes on some crazy adventures, meets some fascinating people and learns what it takes to survive as an artist. With appearances by former members of Das Racist, legendary filmmaker Jim Jarmusch (Broken Flowers, Only Lovers Left Alive), the world’s most renowned Astrophysicist, Dr. Neil deGrasse Tyson (“Cosmos” on FOX) and comedian Martin Starr (HBO’s “Silicon Valley”) among a host of other musicians and personalities.